Captain John with an offshore Mahi. 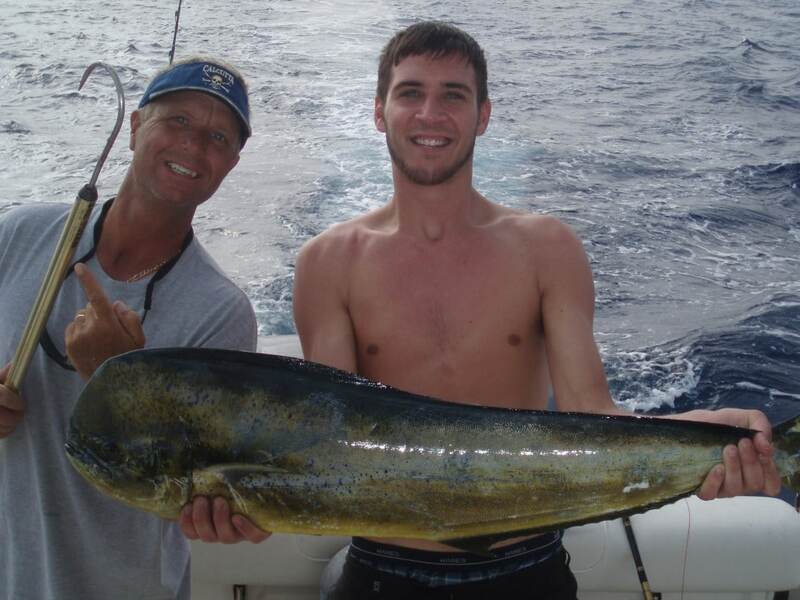 Deep sea fishing for sport or for dining is tons of fun! If you are looking to catch larger fish that put up the fight of a lifetime, we can help. Our boats can travel to the three, five or seven mile markers off the coast of North Myrtle Beach. Here, the fishing is great as fish collect to pound on mullet, bluefish and other baits that collect on the reefs. Targeted species include: King Mackerel, Flounder, Bull Redfish, Black Sea Bass, Jacks and Sharks. We’ll fish with live bait (cut bluefish or large mullets) or larger artificial baits and alternate between dropping down and topwater where needed. We will put you on a large fish that will make your trip to Myrtle Beach memorable! To catch the really big fish off the South Carolina coast, you’ll want to head to the gulfstream (around 50 – 70 miles offshore). We currently don’t offer these offshore trips ourselves, but we can reccomend a great Captain for you. If you are looking to head 50+ miles offshore, we can reccomend some great Captains that can put you on the largest fish: Cobia, Blackfin and Yellowfin Tuna, Mahi, Sailfish, Wahoo and Groupers. Our boats in the fleet are not setup for deep offshore runs, but we can reccomend a Captain or Charter that will put you on these big sport fish. These deep sea fishing runs are often 10+ hours on the water and are made for experienced anglers looking for a real challenge. Contact us today!